Imagine the opportunity to experience some of the most meaningful facets of college – such as intellectual curiosity, community living, and lasting friendships – in a trial run before your junior or senior year of high school. Participants in LENS @ Wake Forest, a residential summer program that equips high school students with the academic foundation necessary to become global citizens, spent the last three weeks doing just that. LENS stands for Learn. Experience. Navigate. Solve. This year, 32 high school students from Calif. to Conn. came to Wake Forest to focus on one theme: Confronting the Challenges of Global Sustainability. While here, they attended classes, developed community action plans and experienced living in a dorm. Program director Leigh Stanfield (center, black dress) with LENS participants. To confront the issues associated with global sustainability, students learned from Wake Forest professors and experts in the biological, ecological, political, economic, and social aspects of sustainability. Experiential classrooms offered participants hands-on opportunities to explore scientific concepts underlying current issues of sustainability, while living labs allowed participants to explore local businesses and organizations incorporating principles of sustainability. 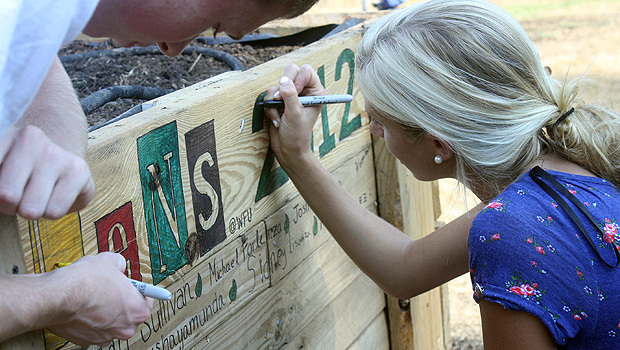 In addition to the interactive service learning, LENS offers students a variety of social events and activities to represent the fun side of college. The LENS participants also made a significant impact on the Winston-Salem community, having logged a total of 745 community service hours during their short stay. Campus Kitchen – a food recycling program that uses cooked but never served food from the campus dining hall to make healthy and nutritious meals for those in need. Campus Garden – a productive research habitat for USDA funded crop research performed by university professors and graduate students and a living lab for biology classes. The Shalom Project – a community non-profit organization that feeds the hungry, offers clothing to those in need, tutors at risk children and cares for the sick. Andrés González’s group assembled a raised bed to make the campus garden more accessible to persons with limited mobility. González, whose father Luis is an Associate Professor of Romance Languages, plans to return to the garden to volunteer for his local high school’s service club. Meanwhile, Graham Shue’s group presented a business proposal and new marketing collateral to help The Shalom Project develop a new concept for its weekly community dinner. 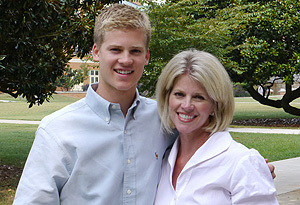 Graham Shue with his mother, Mary (P '13). Graham's older brother, Blake, will be a senior at Wake Forest this year. Shue, a Chevy Chase, Md. native whose brother Blake (’13) is a Wake Forest senior, says he also might return to help assist with The Shalom Project … as a Demon Deacon himself. But for now, he’s proud of the work he and his peers accomplished through LENS @ Wake Forest. “Hopefully we can all put our efforts into action and they won’t stop after three weeks,” said Shue.